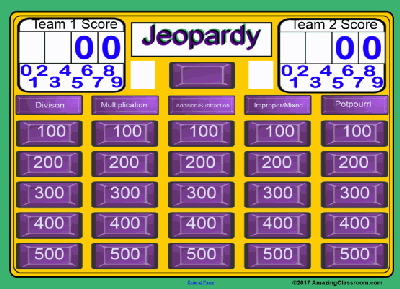 This smartboard Jeopardy game can be used as is or edit the questons to create your own game. 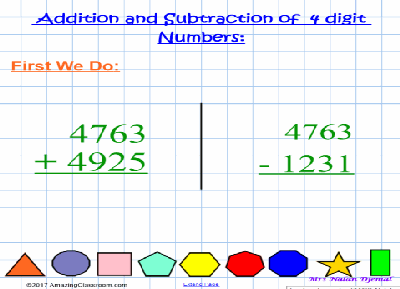 Currently it has adding and subtracting of fractions along with multiplying and improper fractions. 2 players or teams with optional scoring. This smartboard lesson covers the common core state standard 3.MD.B4. It begins with the explanation of a ruler, how it's divided into parts, and gives lots of student interaction time. This notebook lesson allows students to come to the board and measure objects and write the object's length in quarter, half, & full inches. 25 pages provide either containers, or a check your answer section so students get immediate feedback on their answers. Your students will have fun reviewing third grade, common core, math concepts with this twenty-one page Smart Notebook lesson over many different math concepts. 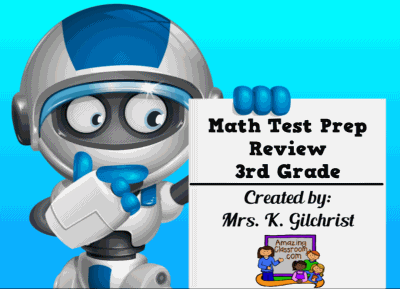 This smartboard file features fun robot graphics that will keep your students interested, and loving to practice math skills and concepts. This flipchart could also be used with advanced second grade students and lower level fourth grade students. Use this Smart Notebook lesson to introduce correct sentence formation to your students. 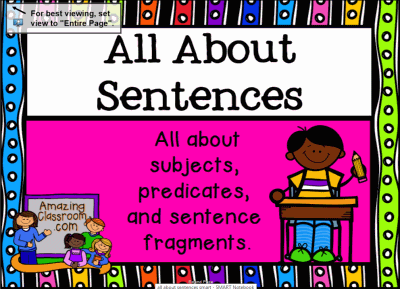 Your students will learn that a sentence expresses a complete thought and includes a subject and a predicate. Students will vote as to which part of the sentence is missing, diagram simple sentences, and identify a groups of words as either a sentence or a fragment. 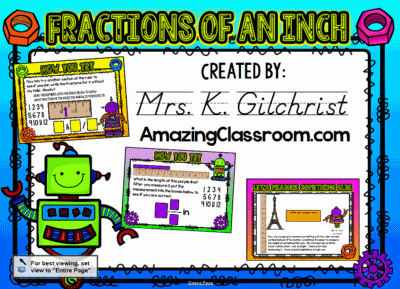 Tons of interaction included in this 24 page smartboard lesson! 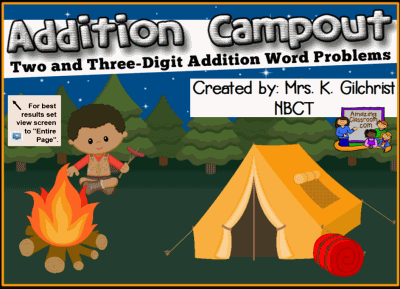 Your students will have fun learning all about multi-digit addition word problems with this fun, camping themed smartboard lesson. This 25 page lesson covers how to line up your numbers so you can add to find the sum, words that help us to know that we should add, and a 4 square graphic organizer to help us better understand and solve addition word problems. Download and print the attached PDF file for students to work along. 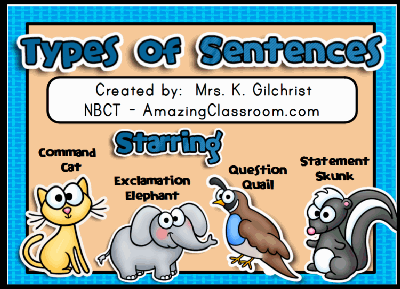 Your students will have a blast learning about the 4 different types of sentences (exclamation, question, statement, and command). 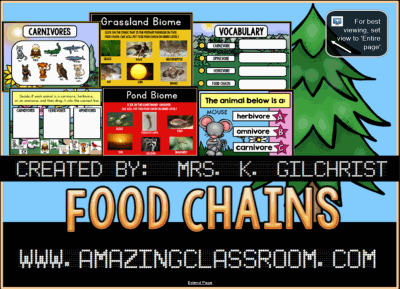 This lesson is designed around characters such as: Command Cat, Exclamation Elephant, Statement Skunk, and Question Quail to get your students interacting and having fun with the lesson.There are multiple opportunities for students interaction and Smart Response voting within the lesson. Enjoy! 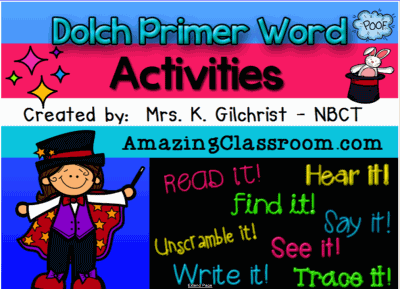 This Smart Notebook lesson contains 104 pages and focuses on the Dolch Primer word list (2 pages for each of the 52 words). One clue page, and one page of 8 activities for each word including a spoken word sound clip for every word. 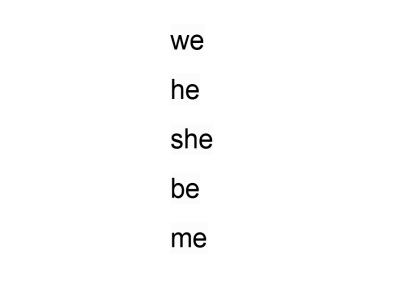 Students get to unscramble it, find it, see it, say it, hear it, trace it, and write it! Use these as a daily review, for RTI, tutoring, or in your daily reading lessons.